New York is sweltering in the summer heat, and Harlem is close to the boiling point. To Coffin Ed Johnson and Grave Digger Jones, at times it seems as if the whole world has gone mad. Trying, as always, to keep some kind of peace - their legendary nickel-plated Colts very much in evidence - Coffin Ed and Grave Digger find themselves pursuing two completely different cases through a maze of knifings, beatings, and riots that threatens to tear Harlem apart. ©1969 Estate of Chester Himes (P)2011 Audible, Inc.
Chester Homes is one of my favorite writers and the reader was very good. Love the language of Harlem at the time the book was set. First off, there could not be a better narrator for these Chester Himes books. Dion Graham brings them to life more than if you were reading the book yourself. This was my very first introduction to Himes, and I am glad I started here although someone who likes a traditional story might dislike this one. This book is very wild and disjointed. Many of the chapters do not fit with each other to make a coherent picture. I've laughed out loud while reading this book, but also its sad in many ways. I was reading this book simultaneously while reading a book about soldiers in WWII. So, I had this book which is about all the hustlers and dregs of society and all of America's racism boiling over, then the other book about what heroes in this country look and act like. You should not read this book if you want to feel good about the country. If you want to see seething black rage towards whites, rampant prostitution, and violence... then this is good. With that said, I think one could miss the theme of this book. It's overall message. Without top notch writing and narration, it would have been worthless trash. I'm almost finished with my first listen to Chester Himes' Coffin Ed/Gravedigger books. Chester Himes was one of the predecessors to many detective novelists today (along with those before him, i.e. Chandler, Hammett, etc) who was largely ignored by the media due to his color. Only now, due to the resurgence of awareness AND admiration for minority writers (Walter Mosley, Junot Diaz, etc.) and the acceptance of minority voices in all forms of literature, are Himes' mysteries being reprinted and now voiced by Dion Graham. The stories themselves can appear as campy pulp fiction, but Himes' writing, and Graham's voice overshadow any cartoonish happenings with Ed & Gravedigger. It's really good to see that Audible & the publishing industry are opening doors and making one of the forgotten writers on the 20th century available to all of us. I love the crime,violence and drama all in one book. It's excitement to my ears. You never know what's next, that's what I love about it. The writer kept jumping all over the place. It was very hard to follow. What could Chester Himes have done to make this a more enjoyable book for you? Too many interludes and not enough follow through. I listened to this book twice. I'm not sure why there were so many random events with no real connection to the end story. It was like listening to a person who is trying to tell me a story but has difficulty staying on topic and finishing a complete thought. Mr Himes, please make sure you bring the story full circle. I'm left wandering how most of the interludes related. Have you listened to any of Dion Graham’s other performances before? How does this one compare? I LOVE Dion Graham! I purchased majority of Mr. Himes books because Dion narrated them. When it comes to fictional reading Dion is one of the best. I can't wait unti his next read. What character would you cut from Blind Man with a Pistol? The old preacher and his wives...what was that about.The murder of the old pimp and wife incident...no closure on that one either.The woman receiving the tv...not sure why he mention this either.. Who killed the white guy?....Any character he added that didn't really have any closure to. I'm just frustrated and disappointed by this book. Too many interludes and not enough follow through. I listen to this book twice. I'm not sure why there were so many random events with no real connection to the storyline. It was like listening to a person who is trying to tell mea story but has difficulty staying on topic and finishing a complete thought. a great book, originally published (in translation) in france, and with an ironic undertow, or overtone, that the present narrator basically ignores. annoyingly, you also get mispronunciations, like "cretin" (a moron) read as "Cretan" (a person from Crete), that make the AUTHOR appear as an illiterate, when it is basically the reader/presenter who is fraught with that problem. 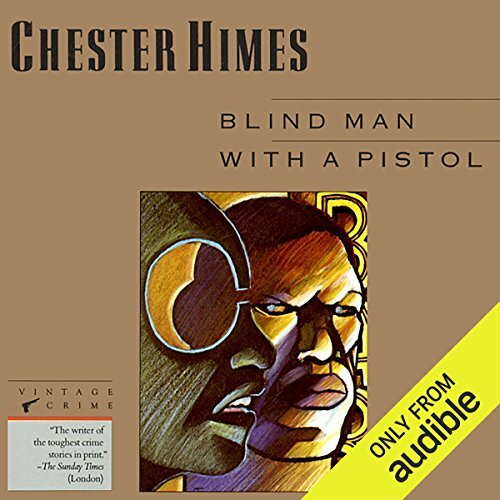 thankfully, audible offers a complete set of chester himes's novels, all of which are great. i know, because i have read them. he is, without doubt, one of the classic masters of the american crime novel. but i feel that he is being presented here, so very nearly completely, largely because he was a black writer --- in other words, as an exercise in political correctness. why else would dashiell hammett, raymond chandler, james m.cain, and a slew of other classic crime writers be missing in audible so d+++ near completely? having himes's very finely tuned novels read by such a masculine black voice identifies the novels as "black" but disallows for some of the literary characteristics to emerge, chief among them the author's humour and irony. chester himes may be writing stories set in a black milieu -- a very largely imaginary black milieu, originally created for the benefit of his french readers, since himes stood not a snow flake's chance in hell of having his books published in the US -- but when he writes novels in the mickey spillane mould, he does so almost tongue-in-cheek, exposing the injustices that "naturally" existed in a world divided into "black" and "white", back home. bringing these stories "home" to america in translation, or perhaps in their original language -- since himes did not write them in french, they only appeared in french translation, and were not necessarily even intended to be published in english, ever, or certainly not at the time --- they needed perhaps a black voice that sounded a little less strident, a little less like some cop show presenter, but rather, a more wistful voice, like that of a reader who had just finished reading the uncle remus stories. then again, i'm not suggesting that chester himes should be turned into some kind of benign teller of fairy tales. maybe a voice like eddie murphy's would have helped --- someone more sprightly, more willing to change his vocal range, or willing to giggle or in some other way suggest the different types of register found in this author. BUT -- you can always try again, can't you? that's the beauty of audible, that different readers can offer different perspectives or alternative takes on the same book.